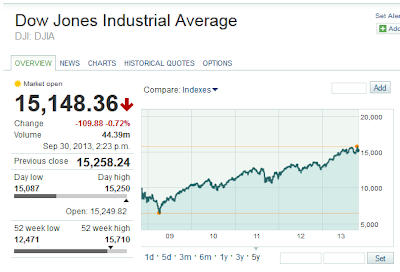 Five Years After – Markets Melted Down but Came Back – how about printers? Leading up to the final days of September 2013 and then on into October, those of us with an ear on stock market news have heard and will hear many references to five-year anniversaries, going back to various milestones that took place during the financial meltdown of 2008. For the most part, these offer very painful memories to relive, at least from a financial pain standpoint, with some significant relief that so much time has passed, and that while the economic recovery since seems anemic in many sectors, that overall the world is in a much healthier fiscal place. 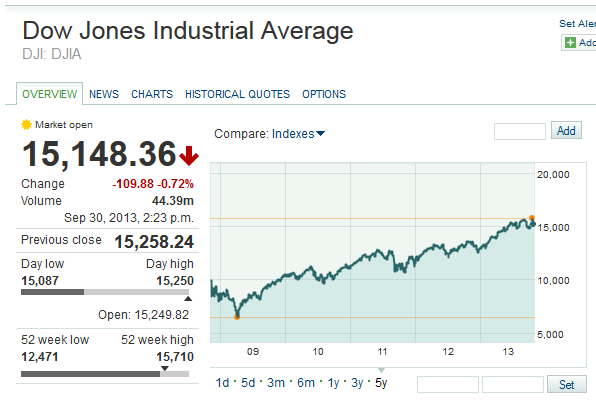 And the stock markets? They have performed quite nicely, thank you very much. 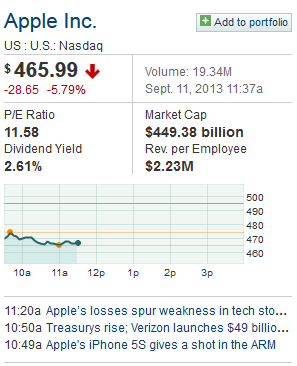 But what of the printing and imaging industry? As regular readers know, I often use HP as a proxy for the entire business, for several defendable reasons. First, they dominate the business like no other – as in, like in no other company dominates printing and imaging, and also, like in no other company dominates so many sectors of a complex industry like HP dominates printing and imaging’s many sectors. Second, I was employed by HP in the printing business up until 2005, and have stayed on as an “HP Watcher” ever since, so I am more comfortable analyzing their activities than I am looking at any other firm in the business. Overall HP imaging and printing revenues back then were nearly $30 Billion annually, and the most recent four quarters ending in July 2013 the company reported just under $24 Billion in sales. The 2008 data follows up-and-to-the-right, steady quarterly gains in the high single digit percentages for the several years leading up and through that tumultuous year. And that 20% reduction over the five years since has come about from a steady decline – 14 out of 20 quarter-to-quarter comparisons have been on the downside (interestingly, the six revenue comparisons which came up positive occurred in sequence, from Q1FY10 to Q3FY11). The supplies component of revenues, always the largest and most profitable, had overall revenues drop from about $4.5 Billion to about $3.8 Billion, just a 12% decline, which speaks to the relative more gentle 14% decline in operating profits as compared to that of overall revenues, at 20%. The printer categories (commercial and consumer) suffered steeper drop-offs (14% and 42%, respectively) which would be expected in a market with declining usage – in a sense the supplies are an “inferior” good in the microeconomic elasticity sense, purchased in lieu of new hardware. Buying new toner and ink for old printers could be seen as the equivalent to households spending money on auto repairs during difficult times, keeping the old beater on the road a little longer. Transportation is required, but now is not the time to buy a new car. A better solution requires more capital outlay, and hoping for better times ahead, delaying the purchase makes sense, at least in the car example. In terms of the printer example, getting more out of fewer or older printer fleets could be the result of active Managed Print Services in the case of enterprises and, more recently, small and medium businesses, or, in the case of home users, just plain less printing, that still justifies the occasional ink or toner purchase, but not a new printer, now or ever. As it turns out, HP was holding one of its “Industry Influencer” summits early in October 2008, which I attended and blogged about. The memory of those days is one of major mixed emotions, as we gathered as HP’s guests in the luxurious Grand Del Mar resort in San Diego, California, just a few miles from the Imaging and Printing Group’s headquarters. And as we were wined and dined, and impressed with HP’s broad array of products and solutions covering an ever-growing range of the printing and imaging business, we were also aware of a Dow Jones Industrial Average which was seemingly tumbling by 500 points a day, every day. It made for an enduring memory, that’s for sure. My two blog posts live from the event make for some interesting reading, five years later. My first (“Live from San Diego”) recaps the conference-opening comments of Vyomesh Joshi (VJ), then (and what seemed like would be forever) HP printer chief. The post summarizes the aforementioned, stellar financial results, and also features links to HP press releases covering the myriad new products and solutions. The second blog post is much more product-focused (“HP is Wild about Wireless”), documenting HP’s push to include wireless connections across their PhotoSmart line of printers. Of course, the first one brings to mind the departure of Vyomesh Joshi, who outlasted his boss at the time, CEO Mark Hurd, and another CEO as well, Léo Apotheker. But after tumultuous times which included the absorption of IPG into the PC business, Joshi retired in 2012, during the Meg Whitman regime as CEO, which continues to current times. And the second post about wireless printers, highlights the difficulty of product differentiation. Acknowledging that they were a bit behind, I was impressed at the time by HP’s push into adding WiFi to many of their printers, knowing that HP could “do it right”. Today, however (and for some time now, really), a printer’s WiFi capability is more of a hygiene factor – something to take note of, perhaps, but hardly a deal-maker, and perhaps more conspicuous by its absence. The value of the perspective from that piece is immense, in part because it makes us mindful that the financial woes of Fall 2008 were preceded by multiple stages of bad and threatening news. It also points out the contrast between the conference venue’s “over the top opulence” and the tone of many of the executive presentations, to say nothing of the frightening downdraft that was taking place in the world’s stock markets during the event. It is also a good reminder of the “Print 2.0” initiative driving the business back then, which has since been shown the door. Overall, while the stock market indices have come back to overtake their 2008 highs (and for the DJIA and S&P500, all-time highs as well), the printer industry, it seems fair to say, has done no better than bounce back to 80% of its former self, with continuing declines foreseen. Fall 2008 was only a little over a year into the shipping life of the first Apple iPhone, and well before the first iPad. Social media and mobile lifestyles were just developing to their current state (case in point - HP announced a MySpace relationship at the conference). And by benchmarking industry titan HP, we can only wonder about the severity of declines in other camps. A version of an old saying, “when HP sneezes, the rest of the industry catches a cold” is probably very fitting for the period between Fall 2008 and Fall 2013. Demise of printing at the hands of the iPad? 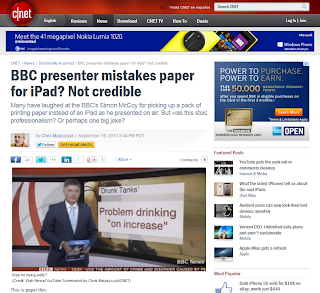 It's a familar story of the last few years, but here's a "man bites dog" version, as related in a CNet story questioning the veracity of the "accidental nature" of BBC newsperson Simon McCoy mistaking a package of office paper for an iPad. As the piece, by Chris Matsyzyczyk, points out, the "heft" of the paper would make it very difficult to mistake for the much lighter iPad. Our industry has been very aware of the shift from consumption of information via electronic devices, like smartphones and tablet computers, at the expense of printers and the supplies and paper which go with them. Here's a purported case, however, of paper replacing the iPad - and does that overall incredulity lead to why it the story is so questioned? 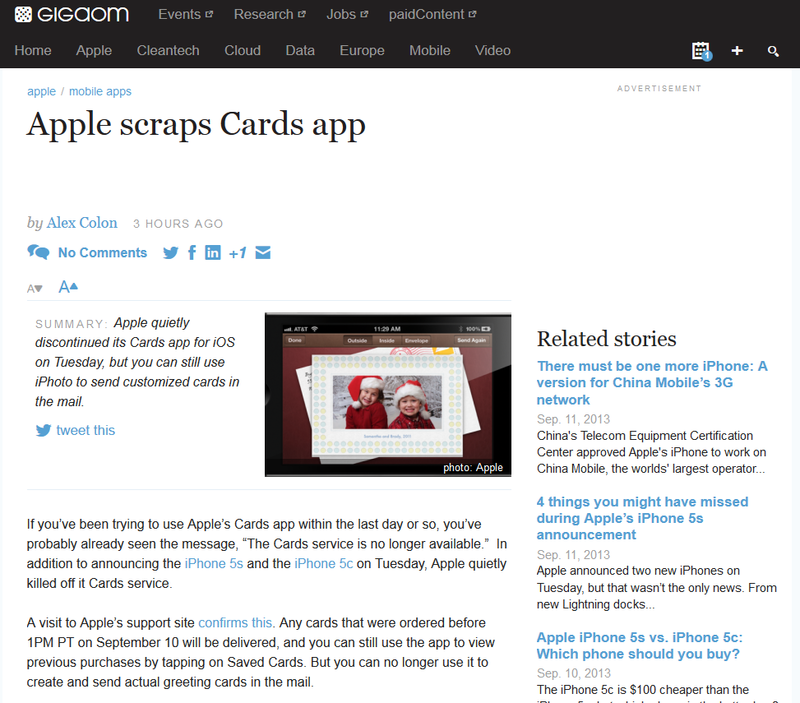 First off, credit for the story about the demise of the Apple Cards app goes to @GigaOM and writer Alex Colon (@alexandercolon). I came upon it during my morning "what's new" search, where it was a part of their "4 things you might have missed during Apple's iPhone 5s announcement" piece. Now a day after Apple's most recent announcement event and its multiple (5c and 5s) iPhone products, which have left Wall Street unimpressed, we have to dig out the tale of Cards and its two-year existence. 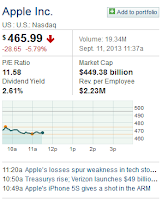 And while investors and industry pundits see the new phones as uninspiring, it's likely very few if any are including the Cards app's discontinuation as part of the overall disappointment which has led AAPL stock to tumble over 5% so far today. But that figures - as hard copy in many of its forms seems to be going out of a favor more with a whimper than a splash.